Lizzy Jagger clearly inherited both her parents’ swagger and sense of style, and began modelling at the tender age of 13. Between starring in Vivienne Westwood campaigns in her teens, walking the dame’s catwalk, and gleaning literary and philosophical wisdom from the designer duo, her memoirs will be studded with gems from the formidable pair. A 30-page portfolio in AnOther Magazine Autumn/Winter 2017 examines the impact of pioneers Westwood and Andreas Kronthaler, and would be incomplete without the voices of their key collaborators. This interview with Lizzy Jagger is one of a series of discussions outlining the curious and colourful world of Westwood. AnOther Magazine: Could tell me about how you began working with Vivienne and Andreas? You were quite young, weren’t you? 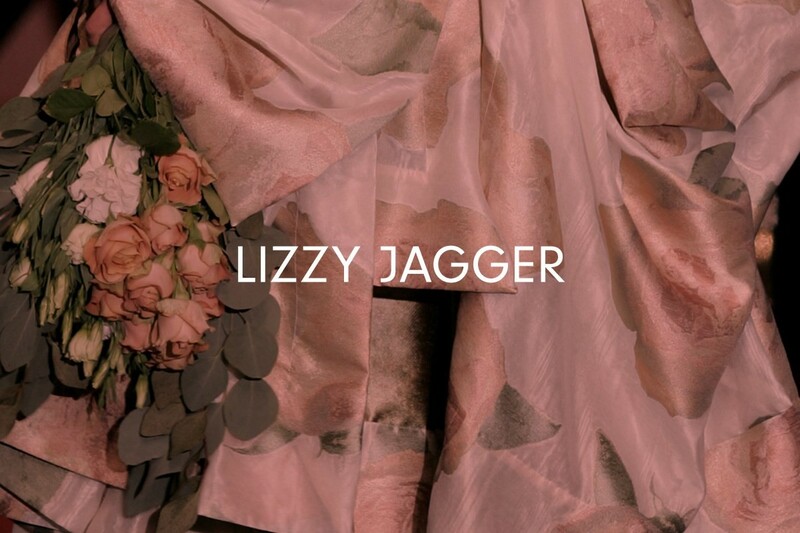 Lizzy Jagger: Yeah. I first wanted to go to a Vivienne Westwood show – I remember I was quite young, it was the Storm in a Teacup show in Paris – and my mum came back from it with all these accessories they’d given her, T-shirts and stuff, and I was really, really into all these little bits that she gave me – rings and stuff. And I was like, “Mum, can I please come with you to the next show?” And so I went with her to the next show when I was 11. And I had a Vivienne Westwood dress on and high heels and I was already like five foot eight and quite grown-up looking. I was already a woman basically. And my mum had me hanging out with her backstage and with her hairdressers. I had been to shows with her but it was my first time going to a Vivienne Westwood show with her. My mum went to meet her and Andreas and asked, “So what do you think of Elizabeth modelling for you guys one day?” And they looked at me and I guess had no idea how old I was and they must have thought that I was much older than I was and they went, “Well let’s give her just a few more years, she’s just a teenager and her shoulders might have to grow a little bit to fit into the clothes”. And then I was really like “Oh no! I’m not grown up enough!” I already really felt like I was growing up really quickly and then I think I was 13 and I’d done the Thierry Mugler show – that was my first fashion show in Paris with my mum – and Vivienne and Andreas were like: “Jerry, you had your daughter doing the Thierry Mugler show? She was going to do our show!” Then I did their campaign, that was my first photoshoot, my first campaign. It was for Red Label and I was in a gold dress holding a giant tuba in five-inch-heels and really long nails. There was a big explosion of fire behind me – it was in an abandoned candle factory in Kingston. It was the wildest photoshoot: I just showed up, I didn’t know what to expect. It was really quite challenging. And hot! Every time the fire exploded I sort of fell forward a little bit, with the heels and holding the tuba with my giant nails. So they had to hang the tuba from the ceiling. I think you can kind of see my age in that picture because I’m just being blown away by fire. I still have the outfit from it. After that I did a show in London; I was playing a harpsichord and that was really fun. I think I was 14 and I was with all these girls I looked up to, like Iris Palmer and Jasmine Guinness and Jade Parfitt, all those London girls. I was the youngest one, and everyone welcomed me in. Vivienne and Andreas were very sweet. They were like: “Oh, you are just like Jerry! You are an English rose!” They were really sweet and so generous. Even if I might not work for them for a few years, then I’ll work for them again. And I see them a lot socially. AM: What was your first impression of Vivienne? LJ: My first impression of Vivienne was that she was ultra-glamorous English fashionista working out of Paris, and she had this great big waft of orange hair at the time. I just thought that she was the epitome of fashion. She was the coolest, because I’ve seen so many male designers working with my mum, and Vivienne was the only female designer that my mum was working with, so it was very inspiring to see all these women working together. Andreas was this incredible cheerleader. AM: Was he very supportive? What did you notice? LJ: Incredibly. He was so supportive. Every time Vivienne had an idea, he would run with it and get so excited. He would get inspired by her ideas. They are such a great duo. And they’re very telepathic now. I think they’ve worked together for so long that they look at an outfit, then look at each other and then add something, do what they are doing, but they don’t really need to talk about it anymore. They have their vision of their style together. AM: What was the atmosphere like backstage at the shows? LJ: Vivienne’s show backstage was always very, very fun and light, and I think how a lot of fashion shows used to be: where everyone was hanging out together. It’s nice that she doesn’t have a uniform look to her show: every look has its own individuality, like every girl does. All the make-up artists and all the hair stylists have their own space to explore creatively. It’s not as stagnant as other shows. And everyone was having a really good time. I think Vivienne Westwood’s shows are definitely the ones that you want to show up to early, because it’s such a great gang and everyone loves to hang out… and Val Garland doing make-up. The last time I did her show was just a couple of years ago now. Two years ago. I got to walk around with the Alice in Wonderland book [the 150th Anniversary Edition with Dame Vivienne Westwood]. That was really fun. AM: What is the relevance of the book? LJ: Vivienne is a great fan of Alice in Wonderland, and so am I. And that’s something that we bonded over. We liked to read out our favourite chapters of Alice in Wonderland to each other in my mum’s garden on the weekends. Vivienne went from my first impression of her, you know, as this super glamorous woman, and now I’ve spent more time with her over the years, my impression is that fashion is sort of her hobby. It’s become so easy and natural to her that that’s kind of just a hobby that’s happening in the background. Her mind rushes and she’s just so clever and she cares so much. She’s so generous with her time and with her charity work that now when I see her I think, “Oh what kind of charity work are we going to talk about?” She’s doing work on climate change right now and she’s really encouraged me with my own charity work. Also with literature as well. She taught me about Huxley and so many different writers. And she has inspired me in my work. I now work in women’s rights in America. AM: It’s amazing that she’d inspired you to do that. LJ: Yeah, definitely. Seeing her so passionate about all of her different charities, especially climate change, I find really inspiring. Just standing for freedom generally. And the Equal Rights Amendment – equality between men and women – actually isn’t in the constitution yet in America. They never passed the amendment in the 70s, so we are still working to pass it here. It takes a lot of patience. Vivienne is kind of my pin-up for it. AM: Do you think she is very patient? AM: Maybe that’s what makes her so impactful? AM: And do you think that’s important, that blend of fashion and activism? Do they help one another, or are they at odds? LJ: I think they go really well together, and I know Vivienne believes that a lot needs to be done in the fashion industry: how we develop textiles, where the fabric comes from, how it’s farmed and how it’s treated. We wear a pair of jeans which takes one whole giant gas tank of water to make. The cycle is so crazy. But I imagine that for Vivienne that connection keeps her excited about fashion: discovering new fabrics, and making fairtrade connections with workers. I think that combination sets a really good example for other designers. I would hope. AM: Do you see that she’s made an impact? Do you ever recognise little flickers of Vivienne in other designers’ work? AM: And do you have any Vivienne looks that you have worn? LJ: My favourite Vivienne Westwood looks are some of the quite wild ones, and I have some of her stuff from the mid-90s. Again lots of tartans, little dresses and crocheted numbers, but I’ve got an orange dress from her Pirate collection. And I think that’s probably my most special just because it’s the oldest and the rarest. AM: Do you still get it out and put it on? Or is it preserved? LJ: No, I have worn it. Definitely. I’ve worn it around. Mainly to festivals and some places where probably I shouldn’t have worn it. But her clothes are so comfortable. I wear them everywhere. One of my favourites I wore on my 21st birthday: I had a private party at Hampton Court Palace and it was Alice in Wonderland-themed. Vivienne and Andreas made me an Alice in Wonderland dress as a present for my 21st birthday. That was so sweet. I kept that and then my sister Georgia wore it when she read out Alice in Wonderland at one of Vivienne's events. So we kind of share a lot of Vivienne’s clothes. AM: Oh wow! That relationship is so embedded in the family, isn’t it? LJ: Yeah, so my mum’s Vivienne Westwood’s dresses are now shared between me and my sister and then she grabs them back sometimes. AM: What do you think the connection is? Why are all three of you are so tied to it? LJ: Well, my father is very interested in history and he taught all of us a lot about the European history of fashion when I was very young – me, my mother and my sister. He had all these books about it. And my mother had her own fashion history books, but they were more American. So I think when my mum started working for Vivienne she already knew where all her inspiration came from. When Vivienne was using pieces from history and shapes from history, my mum always understood the way she made clothes: her nods and her references and what she was getting at with each collection. And I think that me and my sister understand the same language. And I think that me and my mum and sister really like having our own creativity and playing with things. We like to feel individual and different, especially living in America – if I go to a party wearing a Vivienne Westwood dress, no one else is looking anything close to that! AM: With all that history embedded in the clothing, do you think that’s quite unique for a designer? Do you feel like there are many designers that you can go to for that? LJ: I think Vivienne really stands out. And I think other designers often don’t want to move outside ‘the modern shape’. I think Vivienne gives you the option – you can have completely different silhouettes. And you can feel very inspired to change and morph your body and I think some people really like that, being part of their creativity. And I think it’s a shame when people are scared of stepping out of the norm because I’ve never worn Vivienne Westwood and gone to a party and had people say “Oh, you are inappropriately dressed” or something. It’s always, “What is that? It’s incredible! Where did you get that? Oh my God!” It really blows people away. AM: Do you feel like there’s a link between expressing your individuality and Westwood’s appeal? It seems that that’s something you get as a customer when you are buying her clothes but also backstage, when every girl plays her own character. Is that what makes walking for Vivienne so appealing? You get to play yourself a bit perhaps, or is it entirely escapist? LJ: No, you get to play yourself amplified. AM: A bolder, brighter version? LJ: Yeah, definitely. And I think that’s a big part of being a female designer: she accepts and sees and uses the individuality in women, whereas a lot of male designers would rather it be a more uniform, easily sold look. I think there’s a Vivienne shop in Los Angeles, and I when I look in there there are a lot more safe pieces compared to the London stores. Then when you go to the Westwood shop in Japan, it’s all the wild stuff. Mainly handbags, but they kind of go more wild with their shapes, like us Londoners. And I think she is the designer of the English eccentric, if you had to pick someone. Every English eccentric I know is very proud of the few Vivienne Westwood pieces they have.